Tiramisu is one of my favorite desserts and when we were in Italy, I made sure to eat plenty of it. 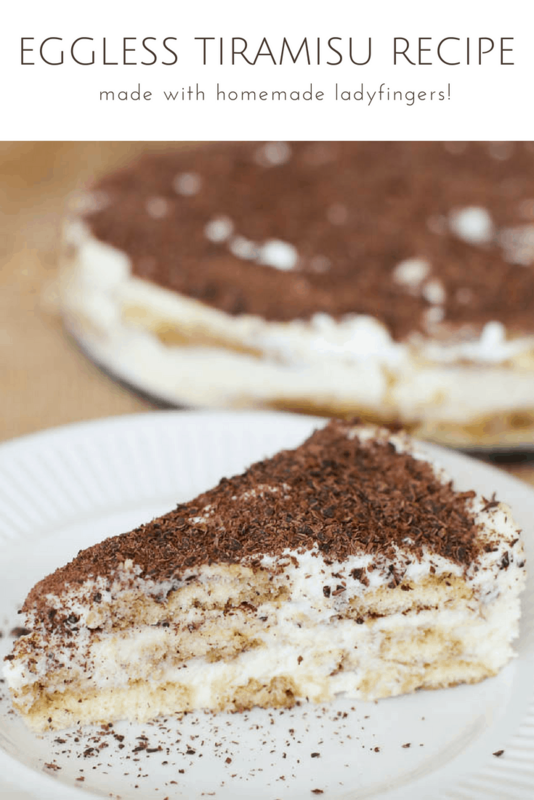 Italian tiramisu is beyond perfect but it can be pretty hard to replicate at home. 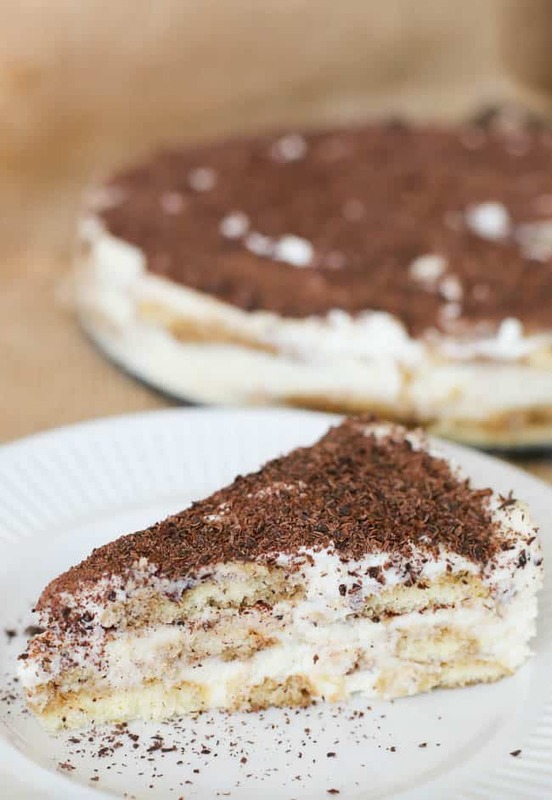 Most authentic Italian tiramisu cake recipes require eggs and while I’ve made a recipe or two using eggs, I was never 100% sold on the recipe. Plus the traditional tiramisu with eggs can be pretty difficult to make and many people deem raw egg eating unsafe. 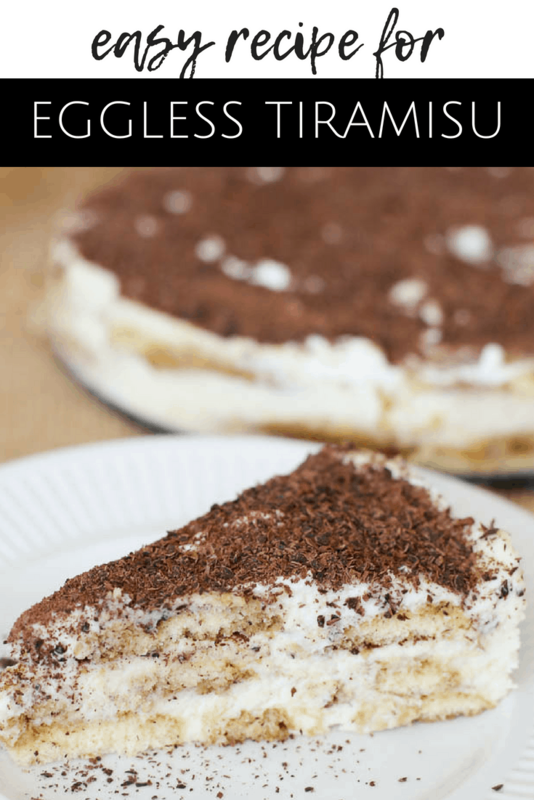 So my mom and I came up with this eggless tiramisu recipe to solve all those issues. It has zero eggs (zero risk) and it tastes amazing. 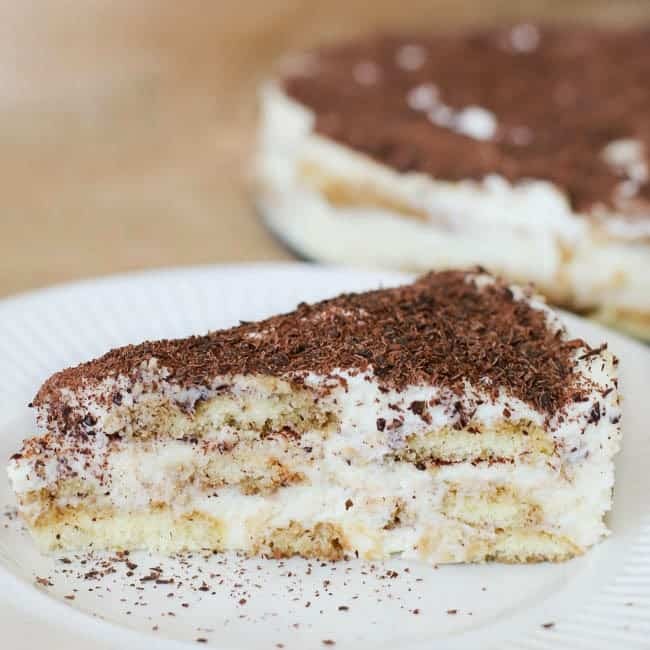 One of the perks of a tiramisu recipe without eggs is that it makes a moderately hard recipe extremely simple and easy to make and it cuts down drastically on your recipe making time. I make this recipe with exactly 9 ingredients; however, I do use homemade ladyfingers. You can make them using my linked recipe or you can just buy ladyfingers from the grocery store. It’s up to you. I love using the homemade ones because they are made without any added chemicals and they taste so fresh. But I’ve made layered tiramisu cake many times using store bought ladyfingers and it tastes just as great. If you choose to buy the hard ladyfingers, make sure you brush them well in the kailua-espresso mixture; otherwise, they will remain dry. 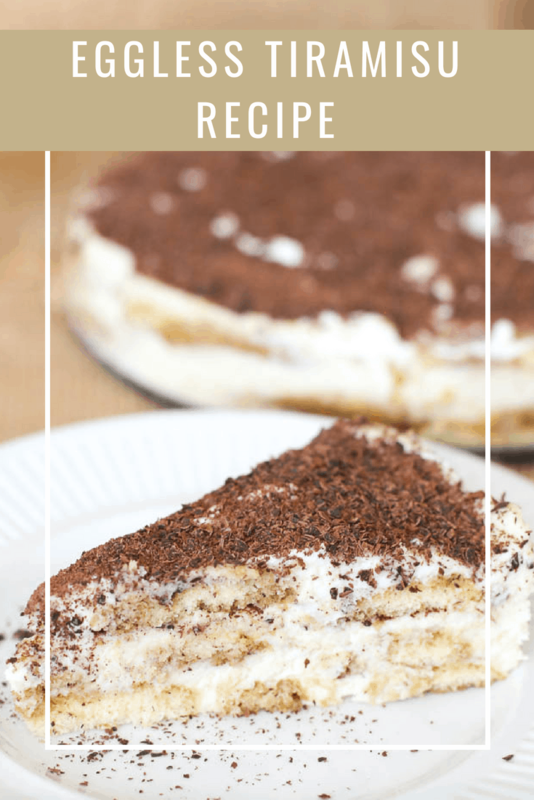 This recipe does use mascarpone cheese as that is the traditional cheese that authentic Italian tiramisu uses. I think it’s a must. I’ve tried cream cheese and it just makes the whole layered cake extremely tangy. Opt for mascarpone and you’ll be happy you did! 1. In a small bowl, mix together liqueur and espresso. Set aside. 2. In a separate bowl, mix together marsala, sugar and cheese, blending well. Set aside. 3. In a third bowl, whisk whipping cream until soft peaks form and then add in powdered sugar and whip until stiff peaks form. Fold 1 cup of this cream mixture into the mascarpone cheese mixture in step 2. Set aside remaining whipped cream. 4. Divide ladyfingers into three batches. Working on the first batch, moisten ladyfingers with liqueur/espresso mixture. *If using hard ladyfingers, dip ladyfingers in espresso bowl to soak. If using soft ladyfingers, brush on the mixture like I did in the above pictures. Layer the first batch of ladyfingers on the bottom of a 9″ springform pan, making sure they are close and touching. Top with 1/3 of the mascarpone-cream mixture. 5. Brush espresso mixture on the second batch of ladyfingers and layer this batch overtop the mascarpone-cream mixture. 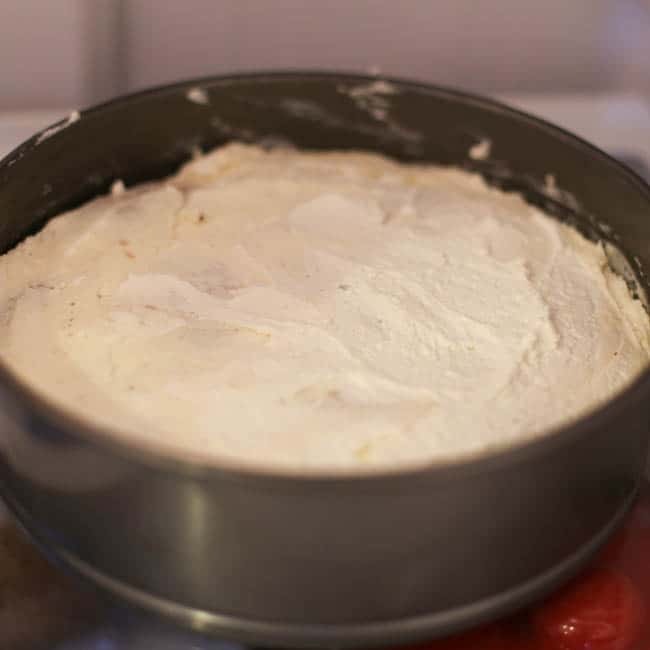 Add another layer of mascarpone-cream and repeat steps with remaining ladyfingers and mascarpone-cream mixture. There will be three layers of ladyfingers and three layers of mascarpone. 6. Top tiramisu with any remaining whipped cream that was set aside at the end of step 3. Smooth top. 7. 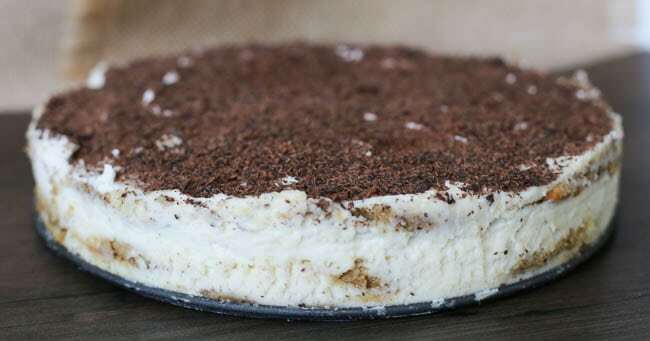 Sprinkle grated chocolate over tiramisu. 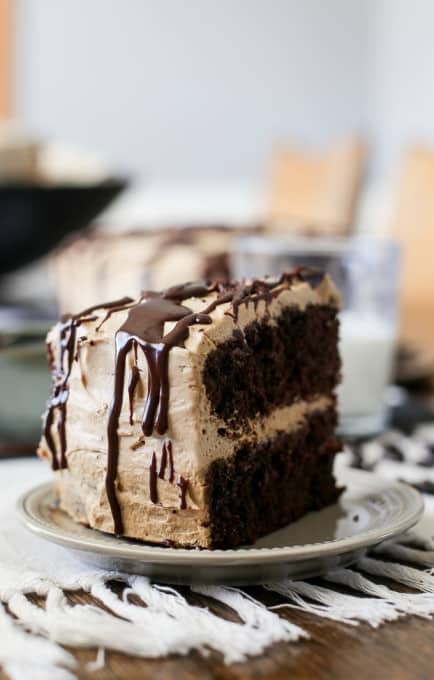 Refrigerate cake for several hours (at least 7 hours if using hard ladyfingers). Once ready to serve, use a knife to loosen sides from pan and carefully remove pan. Note: As you can see from the pictures, the sides of my cake are very rustic looking. 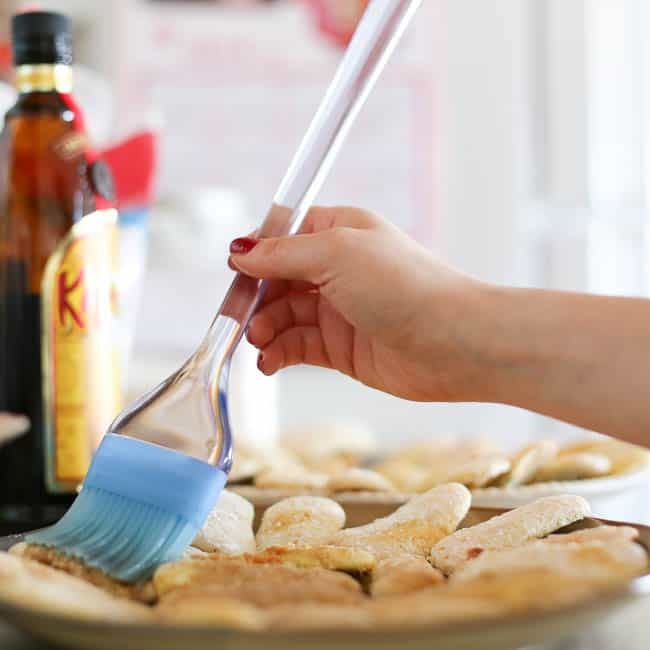 If you prefer a more finished look, whisk 1/4 c whipping cream with 2 T powdered sugar and use this to cover the sides to create a smoother look.